First of all, I'd like to congratulate Ray from UK, DADD, and Judi, all of whom did really well in identifying Charles Dickens as this past weekend's Person-of-Mystery. 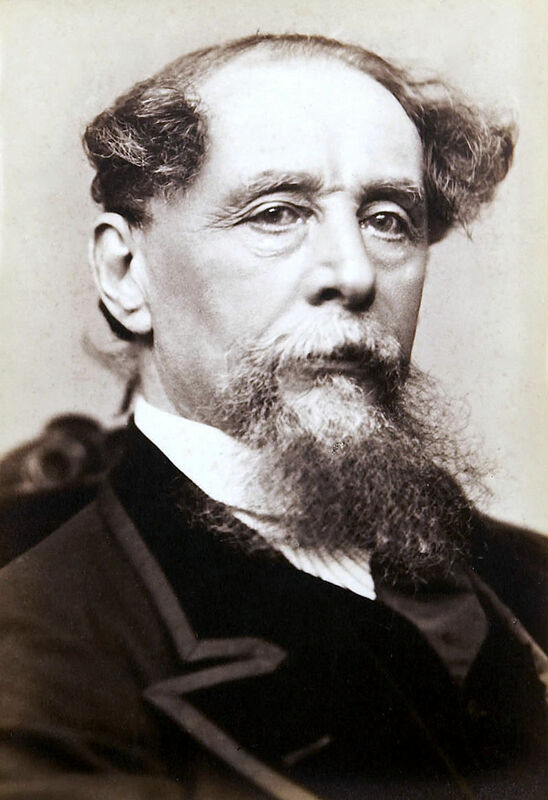 Some of you have become accustomed to me writing about the Person-of-Mystery after the contest, but Charles Dickens is really too well known to do that, so I'm going to talk about something that bothers me a little bit about Dickens, namely his use of the name Ebenezer for the central character in his Christmas Carol. I'm sure authors put a lot of thought into their characters. Often they're looking for an unusual name, but one that's still recognizable to their readers. In 1843, when Dickens wrote Christmas Carol, Ebenezer was a name that was common enough that people would recognize it, but not one of the top ten names of the 1840s. Dickens coupled Ebenezer with the last name Scrooge, which I'm not even sure is a real last name. Doing a quick Internet search, I could only find one phone book listing for one surname Scrooge in the United States and Canada. 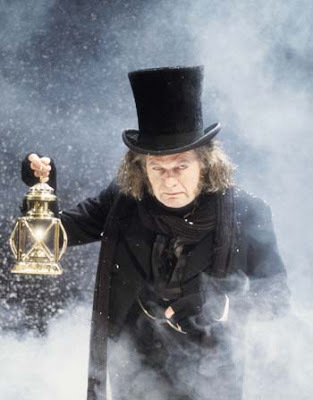 Of course, Ebenezer Scrooge was known for being a mean and miserly individual and someone whom no one would care to emulate until the very end of the story when he has a sudden change of heart. My issue with Dickens is not that he chose a lesser known name to vilify, but that he chose a pretty nice name and ruined it. Of course Ebenezer doesn't sound nice to us today, but this is only due to its near sole association with Scrooge. 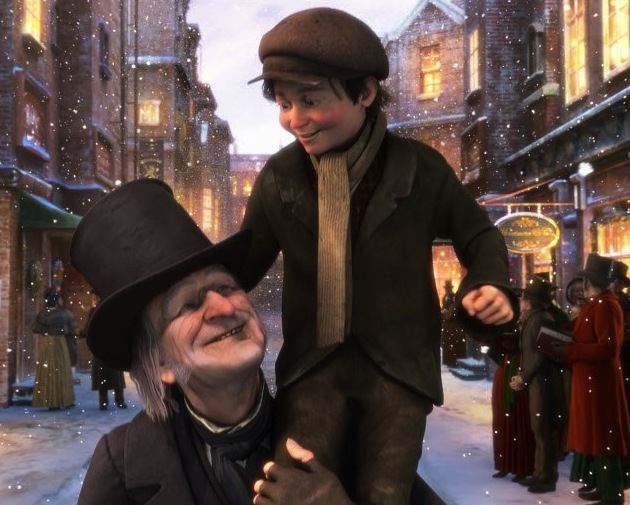 The worst part about it is that Ebenezer Scrooge has a transformative change towards the end of the story, but it comes about so late, that readers remember the nasty parts of Scrooge and not as he would have been remembered by the Cratchit family or the community in later years had there been a continuing plot. Other authors have done this for a long time. 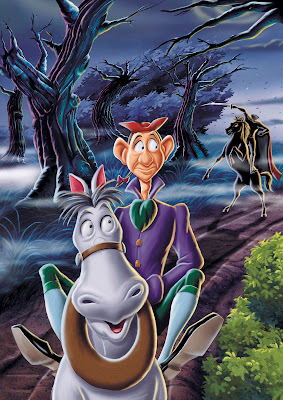 Take the character of Ichabod Crane from Washington Irving's Legend of Sleepy Hollow. Ichabod is a superstitious and awkward character who becomes the eventual victim of the Headless Horseman. I don't see anyone naming their kid Ichabod anymore. So where did these unusual names come from? 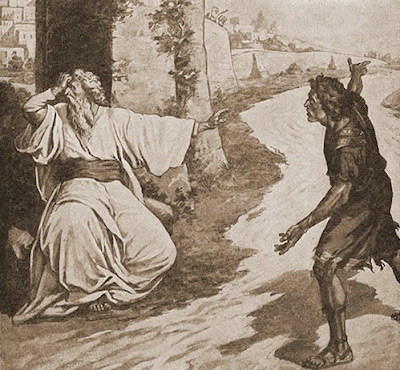 Like many of the names in our culture, they came from the Bible, but there's a world of difference between the names Ichabod and Ebenezer, even though there is a Biblical connection. Ichabod means "the glory of the Lord has departed." 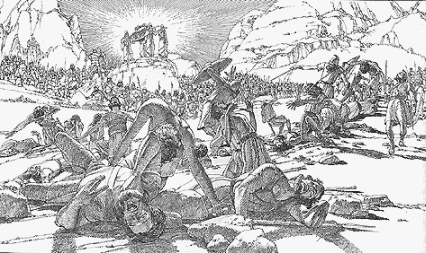 In ancient Israel, the Philistines (think of the stories of Samson or David and Goliath) were Israel's big enemy. Israel had become prideful and wicked. They believed that because God had chosen them as his special people, they would never lose in battle, so they were a little dismayed when they lost about 4,000 men in combat near Aphek. Remembering how God had delivered them formerly, they brought out the Ark of the Covenant (the one that Moses placed the tablets of the 10 Commandments in), believing that God would never allow such a visible symbol of his presence to fall into enemy hands. They were wrong. Because of their sin, God allowed the Ark to fall into enemy hands and even allowed the two sons of the High Priest, who were carrying the Ark, to be slain. One of the priests who was killed, Phinehas, had a wife about to deliver a child. When news of the great loss reached her, she collapsed and gave birth to a son before dying who she named Ichabod in reference to the loss of the Ark. A little later under the prophet Samuel, Israel gets their act together, sets aside their wickedness, and again goes to battle with the Philistines, at the same place. 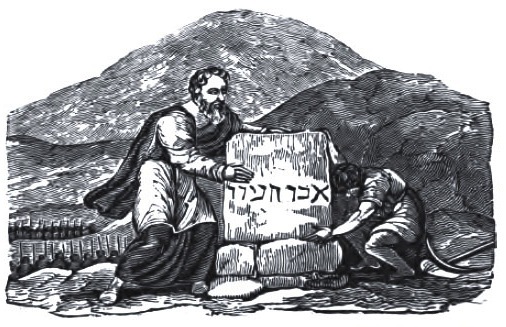 This time Israel is victorious and Samuel erects a stone as a memorial to God's help. 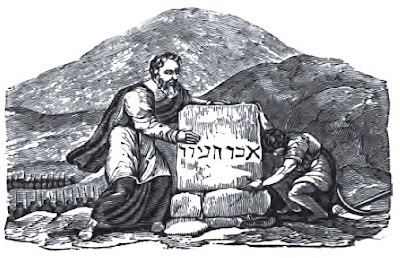 This stone is called Ebenezer, which means "stone of help." So the name Ebenezer, which actually flows off the tongue, has a very good and positive connotation. Ebenezer Benton. Thanks to Rob from Amersfoort for cleaning up the image. 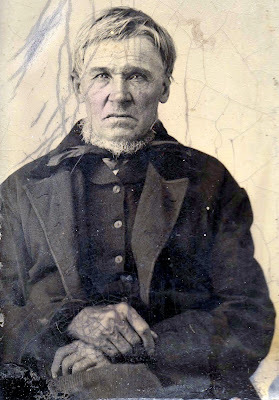 A few days ago, I posted a photo of my ancestor, Ebenezer Benton (1800-1880). I wonder what Ebenezer Benton thought when his name became so negatively associated with Ebenezer Scrooge. It certainly had some bearing on the family. 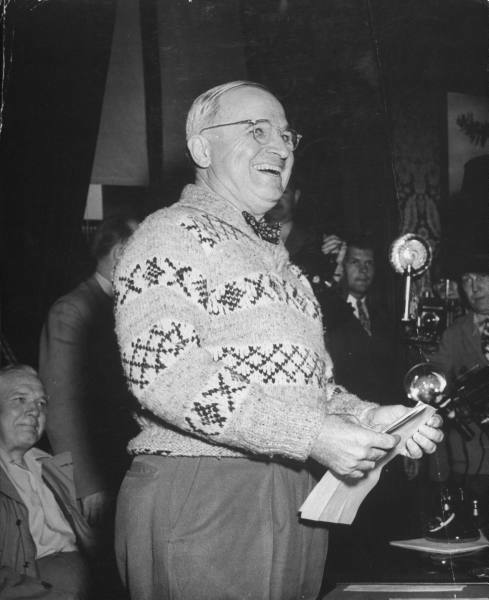 His grandchild, who was named after him was named William Eben Benton (not William Ebenezer), although William Eben always hated having to explain that it was for his grandfather Ebenezer, so when he had a son, he was named William E Benton (the middle name being only the letter like Harry S Truman). It must be hard to have a great name suddenly become ill associated during your own lifetime. 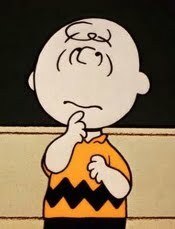 When I was younger there was an older fellow on my paper route, Charles Brown, that hated that a comic character had stolen his name. I just hope no one ever associates my name in a negative or evil way. As for Ebenezer, although I like the name and its meaning, I'm afraid that Christmas Carol is just too popular to reverse that one. My Dad's name was Manson (as was his father's). Even though they loved him dearly, none of my nephews will name their sons Manson because of they associate the name with Charles Manson! What's needed to redeem the name Ebenezer (in the public's mind) is for a gifted author to write a wonderful sequel to "A Christmas Carol" emphasizing the post conversion Scrooge. I'd like to read it! I wonder if the Eben in Irving Bacheller's "Eben Holder" would have been an Ebenezer except for Dickens. I once knew a guy named Ichabod; he was popular, nickname Ick. I find it so interesting how you intertwine all this history for us. You forgot to mention Uncle Scrooge, one of my all-time favorite adventurerer's. LOL. Names are important. When naming our children I remember nixing suggested names that I associated with people I didn't care for. My husband has a difficult name. He is a "junior", so his name is an old family name (his dad is approaching 90). A certain movie about a mermaid, however, suddenly changed his name from masculine to feminine: Madison.